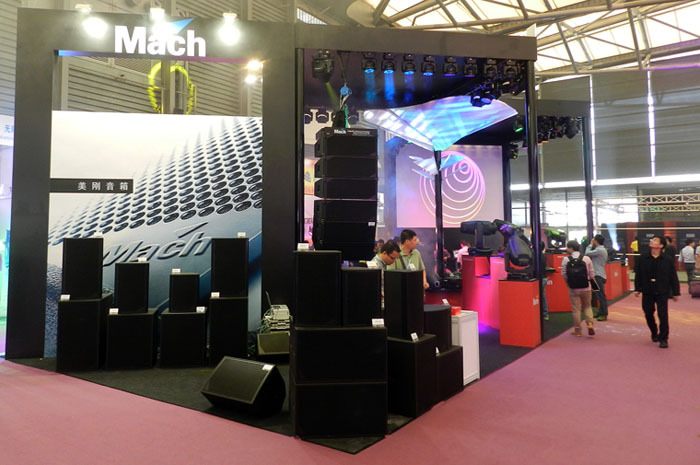 3 new product ranges, total of 12 new loudspeaker models from Mach made their Asia debut at Shanghai Prolight + Sound, designed to fulfill the demands of engineers, contractors and installer who work with professional sound reinforcement system for both live sound and fixed installation market. The new CM-Series is a line of dedicated top boxes for short to medium throw application. It features very high SPL and controlled dispersion in a compact design and is ideal for applications requiring excellent audio clarity and high power performance. Unique flexibility in mounting includes 15 flying points, U-bracket and innovative adjustable "Spider Bracket System" for multiple horizontal and vertical flying options. The CW-Series is a line of powerful reflex loaded subwoofers matching all Mach top cabinets. Constructed for heavy-duty use in professional environments, all combine easy and versatile installation with a high quality, deep and fast bass reproduction. The CX-Series is a powerful and comprehensive sound solution, in order to optimize the performance in the compact cabinet, customized co-axial drive units are used through the CX Series, with remarkable voice clarity and a wide, uniformed dispersion, the CX-Series is a trusted colleague, designed to shine in live productions, AV work, playback or stage monitoring.